This was my first time using hazelnut flour to make macarons. The nice people over at Sidechef.com sent me a little care package for being one of their featured bloggers. One of the items inside the box was this bag of hazelnut meal/flour. I couldn't wait to use it. I love hazelnuts and I love Bob's Red Mill products. I have used their almond flour to make my Conversation Heart and Churro Macarons, their coconut flour to make my Maple Pumpkin Chocolate Chip Cookies, and their rolled oats to make most of my muffins and some of my scones. So thanks SideChef for some great stuff! 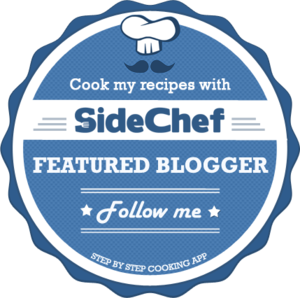 Have you guys checked out the SideChef app yet? You should, it's free and it gives you step-by-step instructions with photos to help you make the recipes. It even talks you through it and has timers when needed. How cool is that? Some even have videos. Sometimes it's nice to have some help in the kitchen. Besides changing out the flour, I also used fresh egg whites this time as opposed to the boxed ones. Wow! What a difference it made. My meringue was much thicker and fluffier. Lesson learned, use fresh. I suppose I should have pulsed the hazelnut flour in the food processor a bit by itself to make the pieces finer, so the final product would be smoother. Oh well. My piping skills are also not the greatest. I definitely would not make it as a pastry chef. Neither of these things will matter in the end, because it's all about the taste. I did taste the shells by themselves before I filled them and quite honestly, I could have eaten them all just as they were. The hazelnut flavor is so heavenly. But I am glad I went ahead and made the filling. This caramel coffee buttercream is amazing. 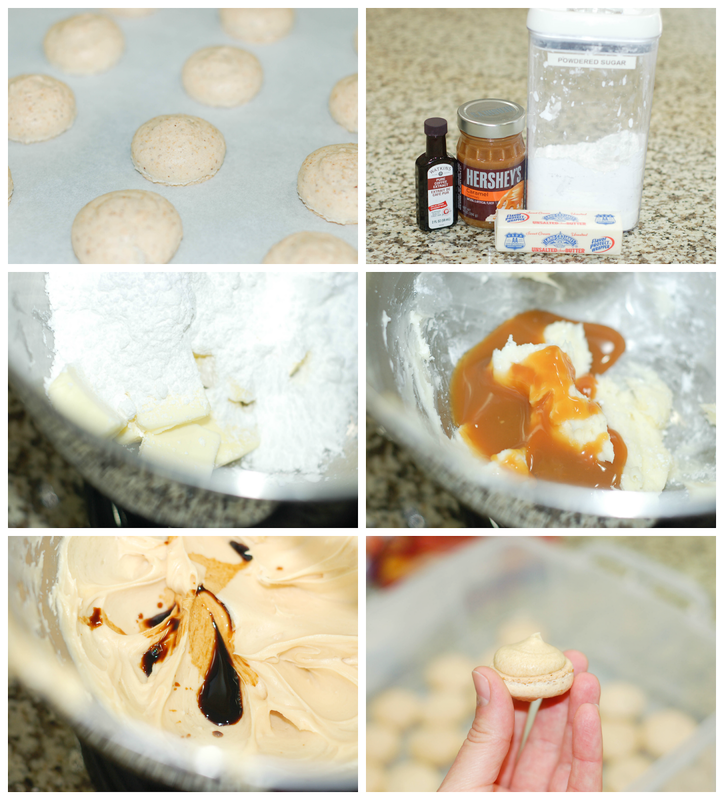 The caramel and coffee flavors work so well together and the buttercream is so creamy. It was really hard not to just grab a spoon and eat it all. I am definitely going to make this again to top some cupcakes. By the way, the coffee extract I used is Watkin's. I found it a Walmart. 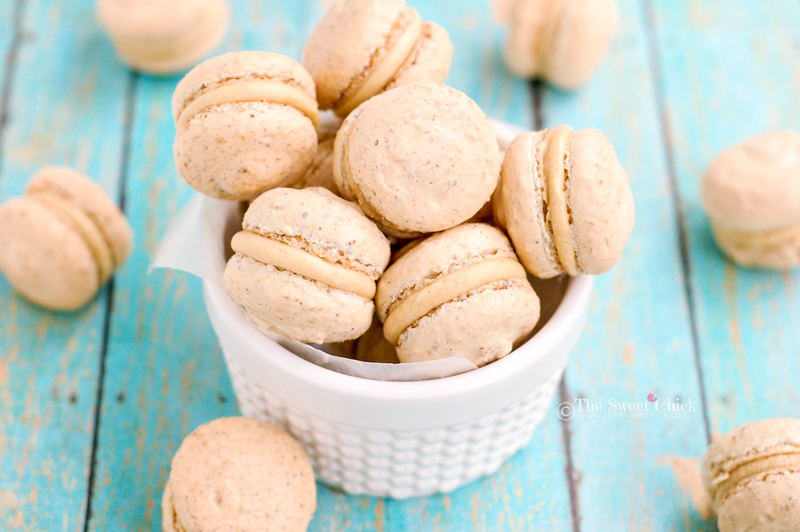 Putting aside my bad piping skills and slightly lumpy shell exterior, these Hazelnut Caramel Coffee Macarons are little nuggets of pure bliss. The shell is slightly crispy on the outside, chewy on the inside. 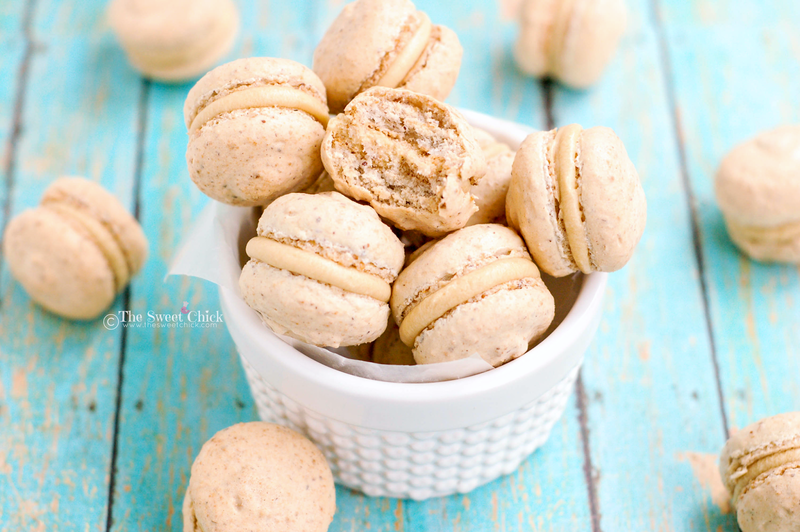 The caramel coffee filling accents the hazelnut macarons perfectly. Now I thought the coffee flavor would make the kids stay away and let the adults enjoy these treats. Nope. The neighborhood kids loved them. And even my picky eating son kept asking for more. Thank goodness this recipe makes a huge batch. If your mom likes hazelnuts and flavored coffee, you've gotta make her these Hazelnut Caramel Coffee Macarons. She will thank you. Prepare circle templates (I made 1 1/2 in circles on a piece of paper a 1/2 inch apart.) and line baking sheets with parchment paper, placing template under parchment. In a food processor, pulse 1/3 of the powdered sugar and all the hazelnut flour to form a fine powder. Then sift sugar mixture 2 times. Sift remaining powdered sugar 2 times also. In a large bowl combine hazelnut flour mixture and remaining powdered sugar. 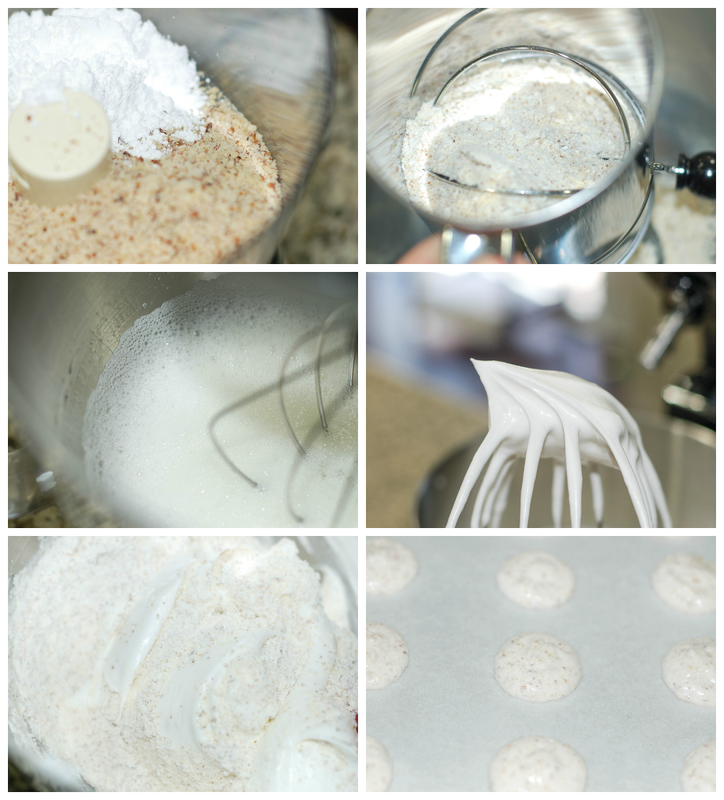 Place the macaron mixture into a piping bag with a round tip ( I used Ateco # 805 or you can use #806). With piping tip 1/2 inch above the template , pipe 1 1/2 inch circles onto parchment paper lined baking sheets. Once finished gently tap baking sheet on your work surface to release and air bubbles and help form the "feet" of the macarons. When ready, bake the macarons at 375°F for 10-15 minutes. (Mine took 10 minutes.) Rotate baking sheets halfway through to promote consistent baking. Macarons will be ready when they are crisp and firm. 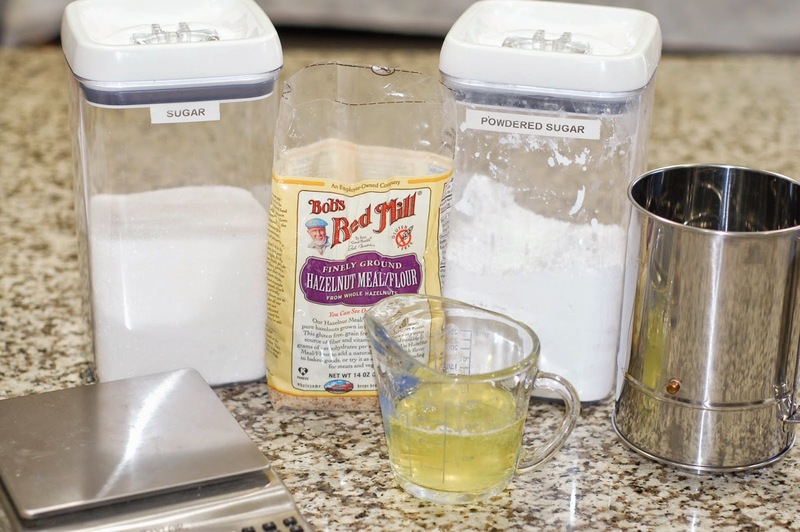 In a stand mixer, cream together the butter and powdered sugar, until smooth. Next add the caramel topping and mix well. Place filling in a piping bag with round tip (I used Ateco #804 or you can use Wilton #2A). Pipe filling onto one macaron and then sandwich it together with another one. Repeat for remaining macarons. 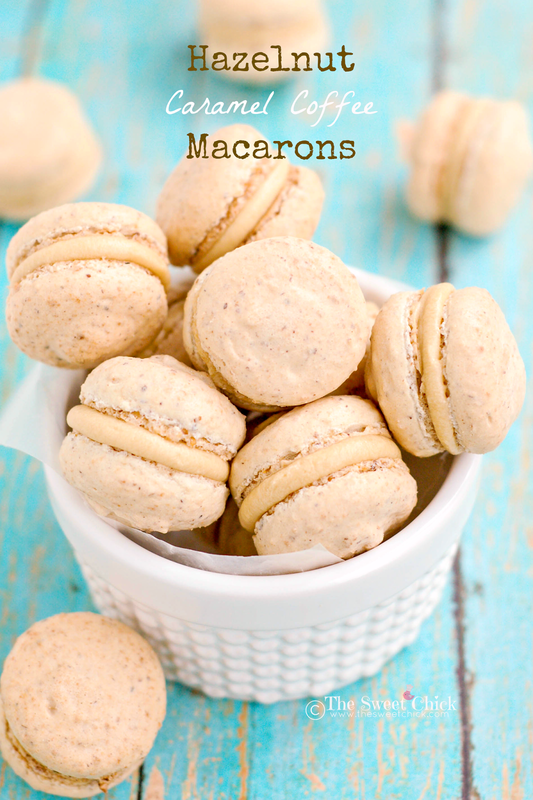 Macarons should be placed in the fridge for 24 hours before eating. This is how they mature and reach their full flavor. You can eat one right away, but when you eat one the next day it will be so much better. Be patient. You will need a kitchen scale and sifter for this recipe. Disclaimer: This is not a sponsored post. Although SideChef.com sent me the product I used to make the macarons, I was under no obligation to create a recipe or review it. I simply liked the product and was excited to use it. All thoughts and opinions are my own. With vanilla or caramel frosted espresso, the syrup is now calculated into the cost when it is rung out at the register. do my college homework. On the off chance that you request, say, a hazelnut frosted espresso or a white chocolate mocha frosted espresso, there is a catch on the register at the cost of the frosted espresso and afterward another catch on the register at the cost of the syrup.